"Best Hair Transplant Surgeon in Chennai"
Dr. Ariganesh Chandrasegaran is amongst the leading Dermatologists and Hair transplant surgeons in Chennai with more than 7 years experience in the field. He has successfully performed more than 1000 hair transplant surgeries at DermaClinix, New Delhi including Chennai center for patients and from various parts of the world. He is amongst the pioneers in use of Bio-stimulated FUE and Bio-enhanced Simultaneous Transplant (B.E.S.T). He is also an expert in doing Giga sessions of FUE as well as beard transplant and eyebrow transplant. He is also well versed and experienced in doing anti ageing procedures like Botox & Fillers, besides other dermato-surgical procedures. He aims to serve the patients with utmost services and thus, put all of his knowledge & experiencing in achieving the same. 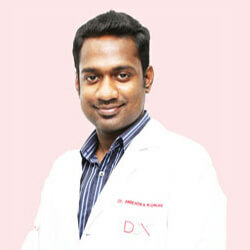 He has completed his MD in Dermatology from the prestigious PGIMER, Chandigarh and M.B.B.S from Pondicherry University. He is a Gold medalist in General Medicine and has publications in international journals like Mycopathologia and Journal of cutaneous and aesthetic surgery. Consultant Dermatologist and Hair Transplant Surgeon at DermaClinix. Mahatma Gandhi medical college and research institute, Pondicherry university. Vinay K, Chandrasegaran A, Kanwar AJ, et al. Primary cutaneous mucormycosis presenting as a giant plaque: Uncommon presentation of a rare mycosis. Mycopathologia. 2014 Aug;178(1-2):97-101. Workshop on non-cultured melanocyte suspension grafting in vitiligo, Cuticon-North zone, Chandigarh. Gold medalist in general medicine in final MBBS.